I'm MD so I like everyone. I do have lots of favorites, though. Can't decide on an oshi since I have 3 favorites that are tied - A. Sato, N. Hirashima and S. Akimoto. 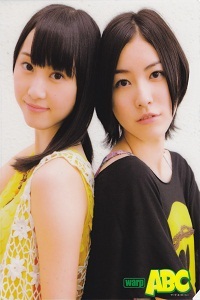 Acchan, Kashiwagi Yuki, and Matsui Jurina come second. Yeah three 2nds. Haha. I'm late to this party, but as my profile picture can be ambiguous, I will make my oshi clear to all. My AKB oshi is Sae-chan, not Yukirin. Of course, I wouldn't mind being kissed by Yukirin too, but that's another matter. My SKE oshi is Jurina, if anyone cares. People here are much more friendlier than nihongogo. Watanabe Mayu, but I don't understand the notion of multiple oshimen. It's too much information for my brain although having different favorites can be more interesting. I'd rather focus on one thing at a time, and it's not too hard because Mayuyu is so incredible. hahaha .. sorry, I love all Family48 ... but the most I love is SKE48 ..
Oshima Yuko! for me she has the potential of being "oshi". has good personality and she is great in terms of being an idol. equally with her for me is Minami Takahashi. has pure heart and funny. under her, Matsui Jurina!! for me she can be the next FACE of the AKB48 after Acchan <3. I think she's passionate when performing, great smile and good moves.